Green clay also known as sea clay or illite clay is highly beneficial for cleaning and invigorating the skin. It exfoliates the skin and helps draw out oils and toxins from the pores. Being rich in minerals like silica, aluminum, potassium, magnesium, selenium, etc., it facilitates the process of healing. Green clay has anti-inflammatory and analgesic properties. Plus, it strengthens the connective tissues and stimulates blood circulation. French green clay, in particular, is loaded with antibacterial properties and hence, used in most beauty recipes. It should not be used on dry or sensitive skin, though, as it tends to make your skin dry. Besides, Bentonite clay is good for skin as well as hair because it has a high pH. 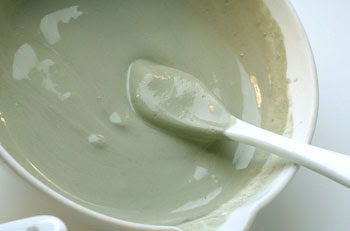 While preparing a facial mask with green clay, make sure you select green clay powder that is safe for cosmetic use. In addition, it is suggested to avoid using metal spoons and containers while making these recipes. Thus, you can make use of glass, wood or ceramic products. • Simply applying a paste prepared by mixing sufficient water in green clay for almost ten minutes tightens the pores and removes dead skin cells and excess oil. You may use it along with milk, cream, yogurt, rose water, herbal infusions, or honey, too. Follow this easy skin-care regime once in a week to make your skin radiant and smooth. When dealing with dark spots, you can apply this paste daily on the affected areas. • Soaking in a bath tub containing water mixed with half a cup of green clay helps soothe sunburn and skin irritation. • Make a face mask for greasy skin by adding one teaspoon of aloe vera juice and half a teaspoon of jojoba oil in two tablespoons of green clay powder. Finally, put one drop each of lavender essential oil and grapefruit essential oil in it. Here’s a video showing how to make an organic green clay mask. • Applying a combination of green tea and green clay is useful for maintaining youthful skin and reducing acne inflammation. • Grind half a cup of rolled oats in a blender or coffee grinder. Add this oat flour in a cup of green clay along with four drops each of mint and lavender essential oils. Take one tablespoon of this recipe, mix two tablespoons of water in it, and apply on your face and neck to rejuvenate normal skin. Store the rest in a container for future use. • To cure acne, you may add about one or two teaspoons of witch hazel extract or apple cider vinegar in two teaspoons of green clay and apply the resultant paste on your skin for about 10 minutes, until it dries. You may also add honey in it. • Mix five tablespoons of French green clay in one-eighth cup of rose water and a few drops of an essential oil of your choice. Spread this homemade face pack on your skin and then rinse it off after 10-15 minutes with lukewarm water. Follow up with a moisturizer. Apart from these face masks, green clay can be used as in alternative medicine as a natural remedy for ailments like indigestion, diarrhea, heartburn, morning sickness, menstrual cramps, muscular pain, and so on. Furthermore, you can take green clay pills for detoxification of the body.